Some of the organizations and media working for peace and keeping the public informed. Bring Them Home Now Tour – military families who have lost loved ones in Iraq and Afghanistan or have loved ones in harm’s way and veterans of the wars in Iraq and Vietnam have joined together to tell their stories and to call on this administration and congress to end the war and bring our troops home now. CODEPINK: Women for Peace – a grassroots peace and social justices movement seeking positive social change through proactive, creative protest and nonviolent direct action, calling on women and men around the world to rise up and oppose the war in Iraq. Food Not Bombs - a collective of autonomous organizations who recover food that would otherwise be thrown out and make fresh hot vegetarian meals that are served in city parks, at protests, and other events. Food Not Bombs provided most of the meals at Camp Casey in August. Meet with Cindy – formed to persuade President Bush to meet with Cindy Sheehan and answer her questions about why the war that took Casey’s life was started and why it is being continued. Meet with the Mothers – formed by individuals to spread the spirit, power, and love of Camp Casey and to bring Cindy Sheehan’s call for answers about the war to Congressmembers, who have the power stop the war. Sponsored by Gold Star Families for Peace. MoveOn.org – 3.3 million members working together to realize the progressive vision of America’s founders by taking stands on important issues and making sure these voices of ordinary citizens are heard. 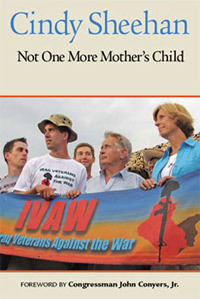 Not One More – individuals taking Cindy Sheehan’s questions to governors, members of congress, and others who have the power to stop the war. Not One More Lie, Not One More Day, Not One More Dollar, Not One More Life. Sponsored by Gold Star Families for Peace. True Majority – a grassroots education and advocacy project that takes action on issues based on compassion, charity, and justice, the values we must adhere to in order to build a safer, more secure home and world. United for Peace and Justice – 1,300 groups joined together to oppose U.S. government’s policy of permanent warfare and empire building. Gold Star Families for Peace – families who have suffered the tragic loss of a child in war organized to raise awareness about the true human costs of the invasion of Iraq, to bring an end to the occupation, and to reach out to other families who have lost loved ones as a result of war. Iraq Veterans Against the War – veterans who served since 9/11/01 who are committed to the immediate withdrawal of all occupying forces in Iraq and to making sure all veterans receive the benefits owed them. Military Families Speak Out – relatives and loved ones of those in the military who are opposed to war in Iraq. Veterans for Peace – veterans—drawing on their unique experiences and perspectives—committed to raising public awareness of the true costs and consequences of militarism and war and to seeking peaceful, effective alternatives. For our democracy to stay alive, we need access to independent, diverse sources of news and information. Air America Radio – a liberal radio network featuring presentations, interviews, listeners’ calls, and news. Featuring Al Franken, Randi Rhodes, Thom Hartmann, Laura Flanders, and others. Democracy Now! – a daily, independent, award-winning news program offering access to people and perspectives rarely heard in the corporate-sponsored media, hosted by Amy Goodman with Juan Gonzales, airing on over 380 radio and TV stations, with audio and video-streaming. Free Speech TV – independent national TV channel that reflects diversity, provides underrepresented perspectives, and encourages citizens to work for change. On DISH Satellite Network. Independent Media Center – a collective of independent media organizations and journalists offering grassroots, non-corporate coverage for the creation of radical, accurate, and passionate tellings of the truth. Link TV – offers in-depth programs with a global perspective, giving voice to the voiceless and encouraging action on the part of the viewer. On DIRECTV, DISH Satellite Network, and Direct Broadcast Satellite Television.